Earlier this year we heard the lovely news that Jak and Ellie were going to get married this autumn. How exciting! What could we contribute (other than the usual parental support)? 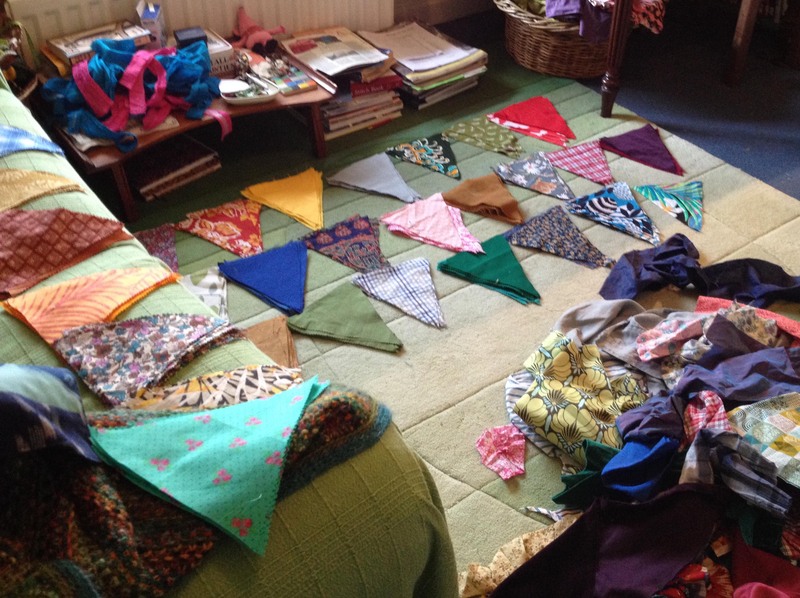 The idea of bunting was floated – not sure where it came from – but, yes, of course we could make bunting! I’ve never made bunting before, so the first thing was to check out websites. 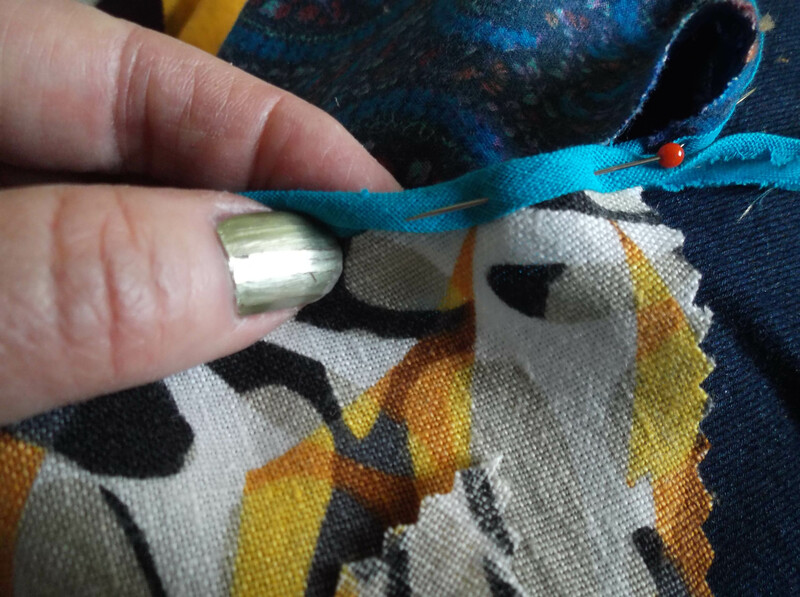 I gathered that a lot of bunting is made by seaming two triangles together and then turning the sewing inside out. 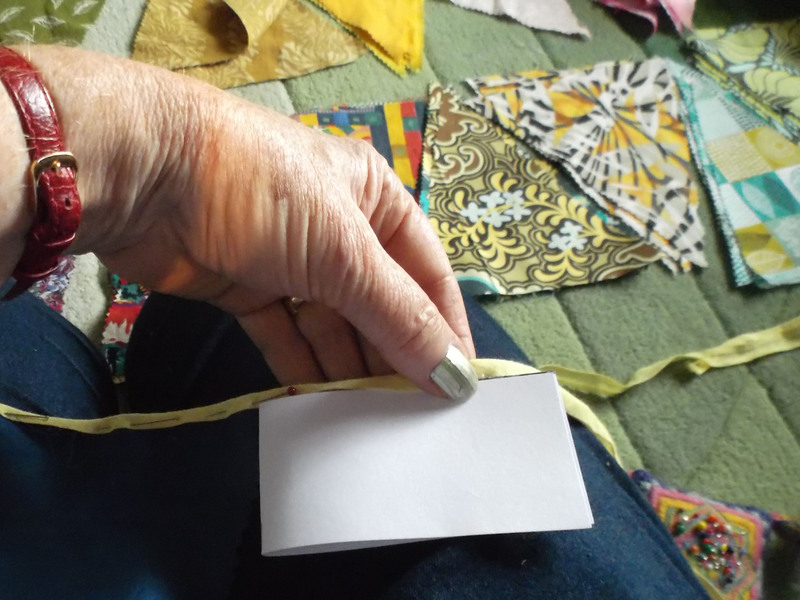 However, I was in a rush – and had a lot of bunting to make, so my heart lifted when I found a site that recommended using pinking shears to cut out each triangle. So much easier, Here is the template I used. I have to admit I wasn’t very systematic with my bunting factory. 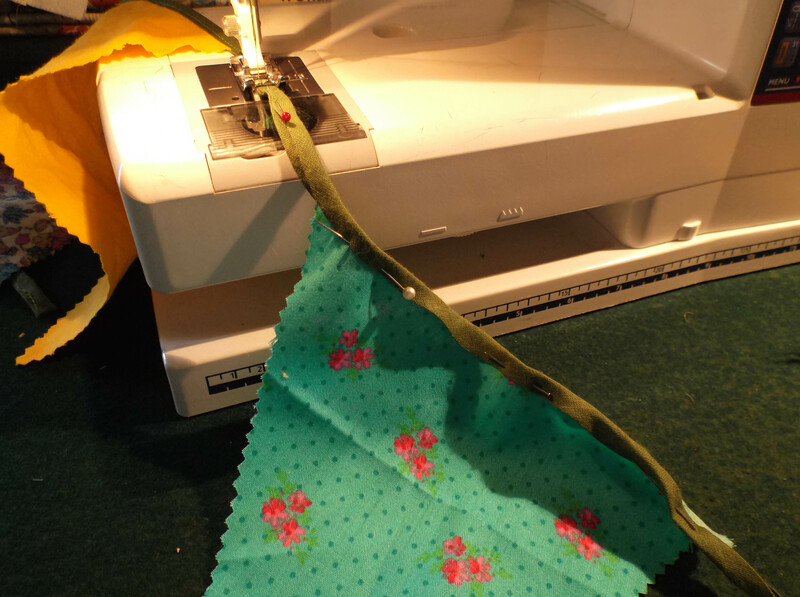 I started with a pile of suitable fabric that I found in my stash, and added to it with a couple of brightly-coloured dresses bought from a charity shop. 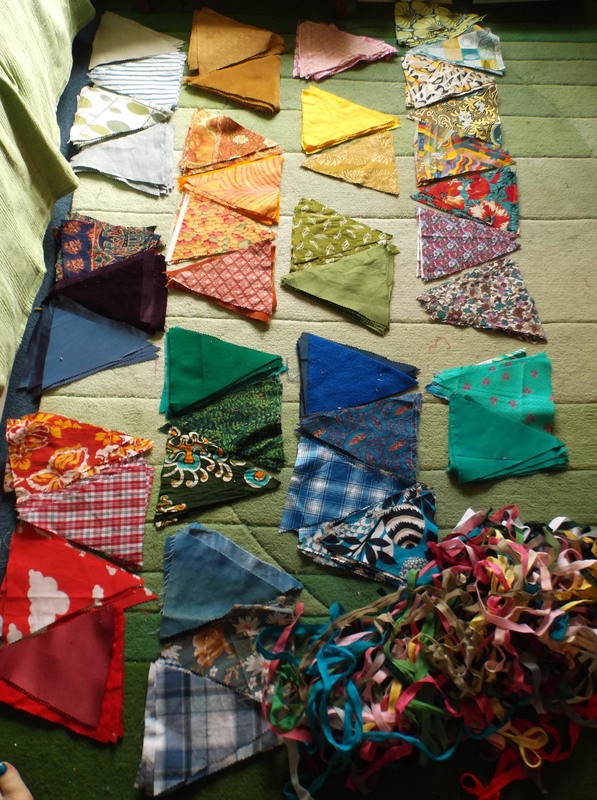 Soon the fabric began to morph from a wild heap to tidy piles of coloured triangles. Digging deep into my stash, I also found a large collection of bits and pieces of bias binding that my mother had given me when she gave up sewing. So with all the goodies assembled, I was ready to start putting it all together. Searches on line indicated that the distance between the placing of each individual flag varied enormously. I chose to place my bunting pieces half the width of a flag apart Here is my nifty little measuring card to help me measure quickly and efficiently. 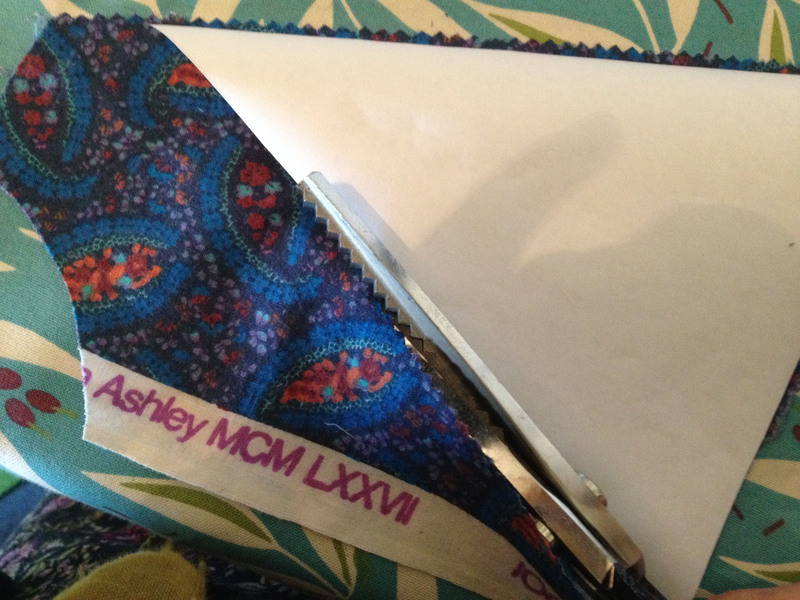 Then the bias binding was pinned over the top of each bunting flag. Ready for machining now. A little trial with our first small stream of bunting. Yes, it’s OK! 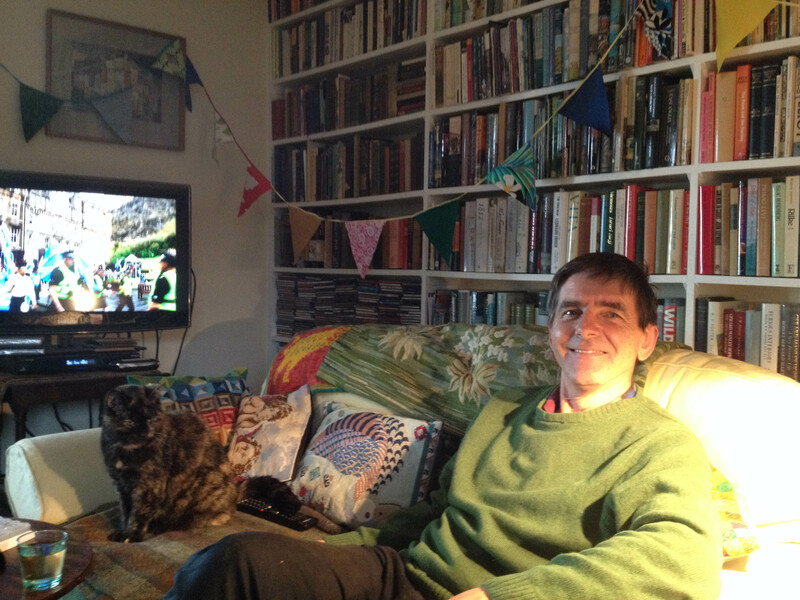 The cat and the man were happy! Meanwhile, we started working on another string of bunting. This one was going to have words on it, so we had to do letters. Stephen printed out some good size letters on the computer. Using these letters as a template, I cut them out in fabric. 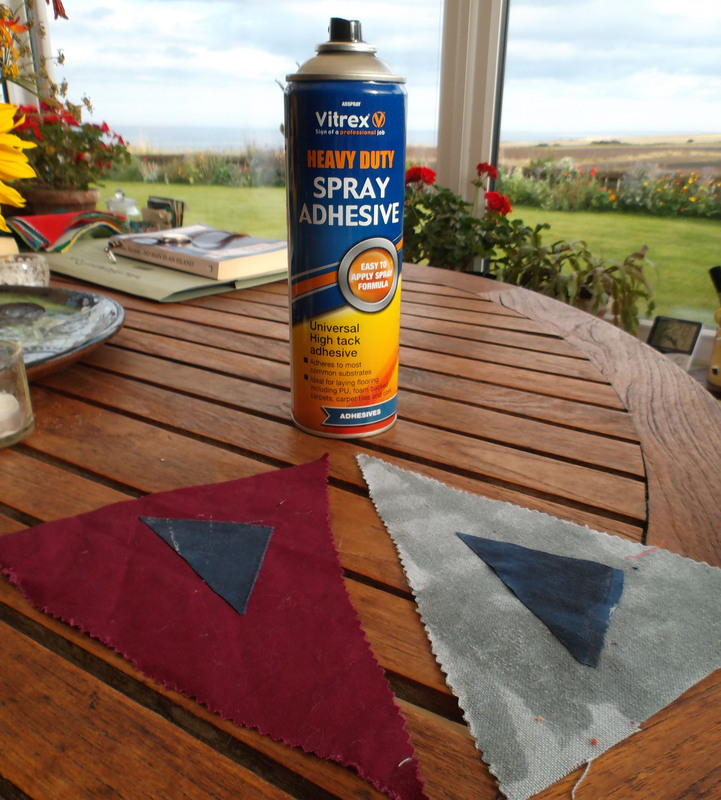 We bought some spray glue, and did a couple of test sprays to see how effective it was, and whether it marked the fabric too much. 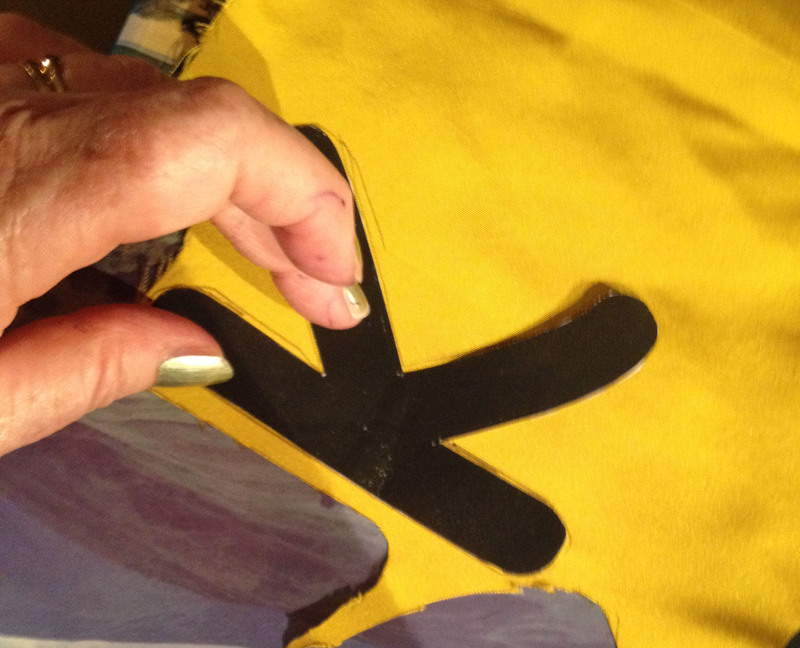 If we sprayed glue on both surfaces (as advised) the fabric was very marked when dry (right hand sample). 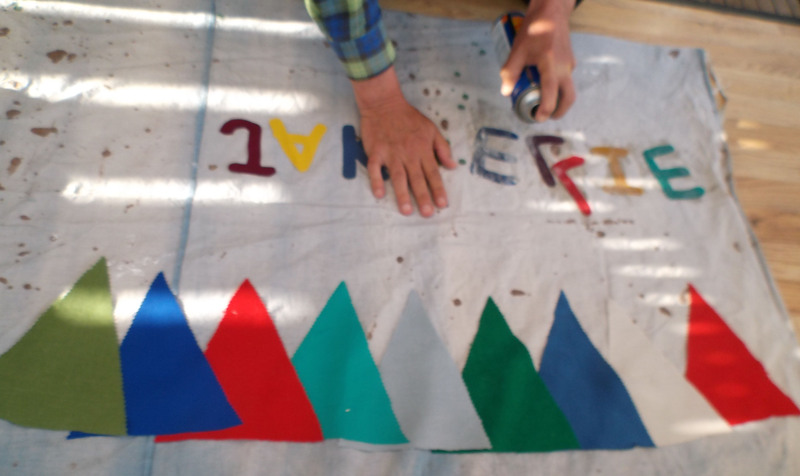 So we decided to spray just the back of each letter, and then press the letter onto the bunting flag firmly. Easier said than done! The glue was very sticky indeed, and the operation had to be completed quite quickly. Just everything got gluey and sticky – and the finished effect was OK, but not brilliant. 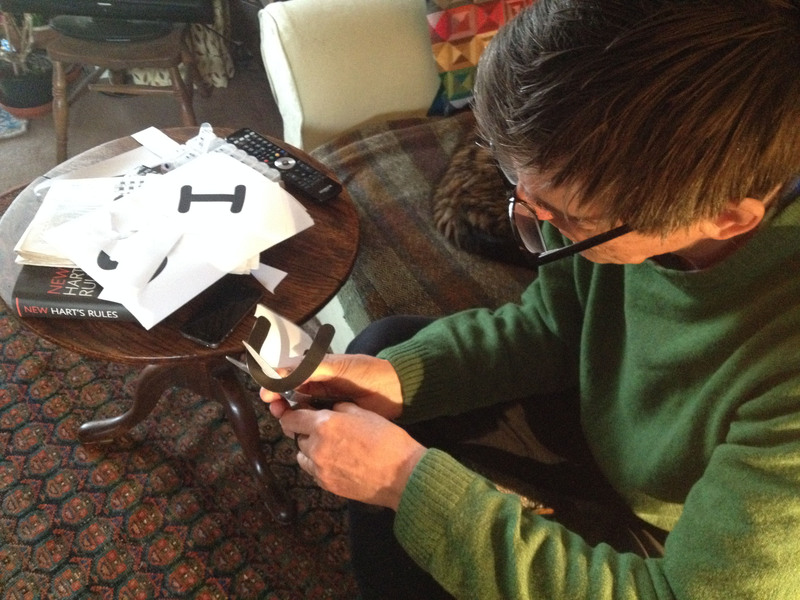 So here’s the letter bunting ready for sticking – after Poe’s inspection, of course. 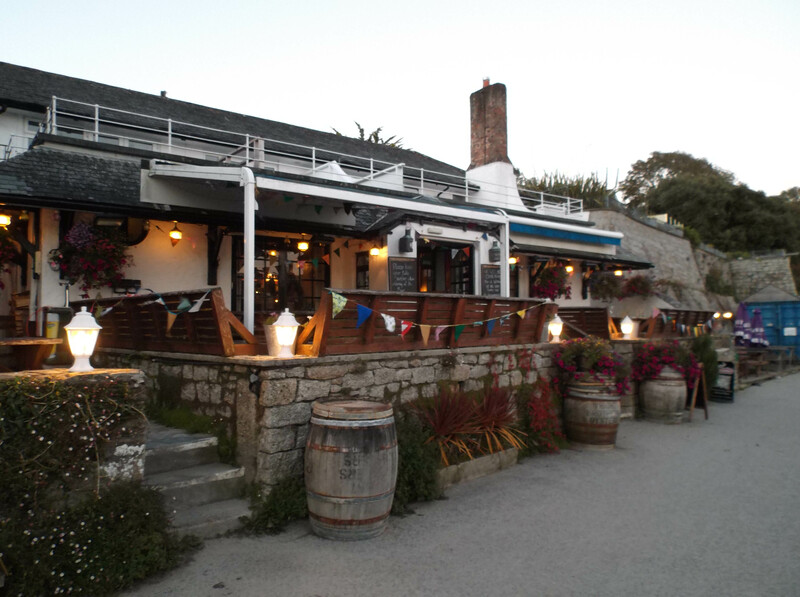 The bunting was finally ready to send to Cornwall for installation in the pub (the Ferryboat Inn at Helford Passage). 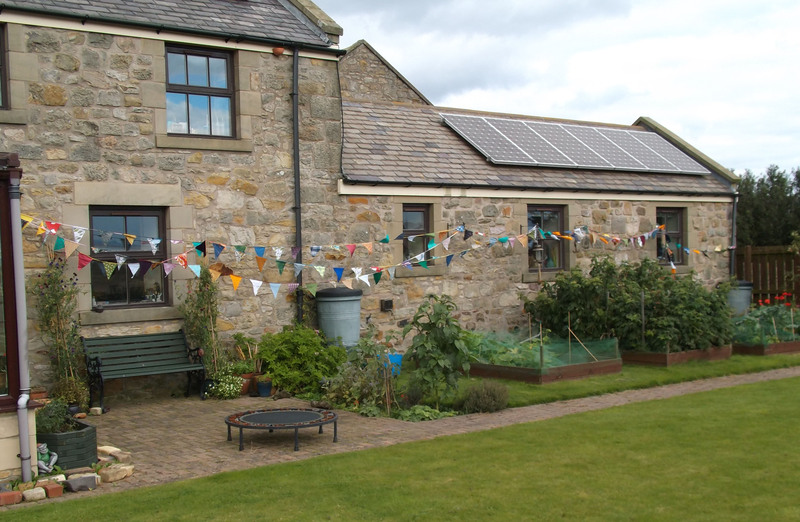 Before we sent it off, I couldn’t resist hanging the bunting on our Northumbrian cottage. So, on a wild and windy day, we forayed out and wrapped the bunting three times across the length of the house. It did look lovely fluttering in the wind. Now we were ready to prepare it for postage. We’d been warned that loose bunting knots up very quickly, so the bunting was carefully wound round a piece of strong cardboard, and posted off to Cornwall the week before we travelled there ourselves. 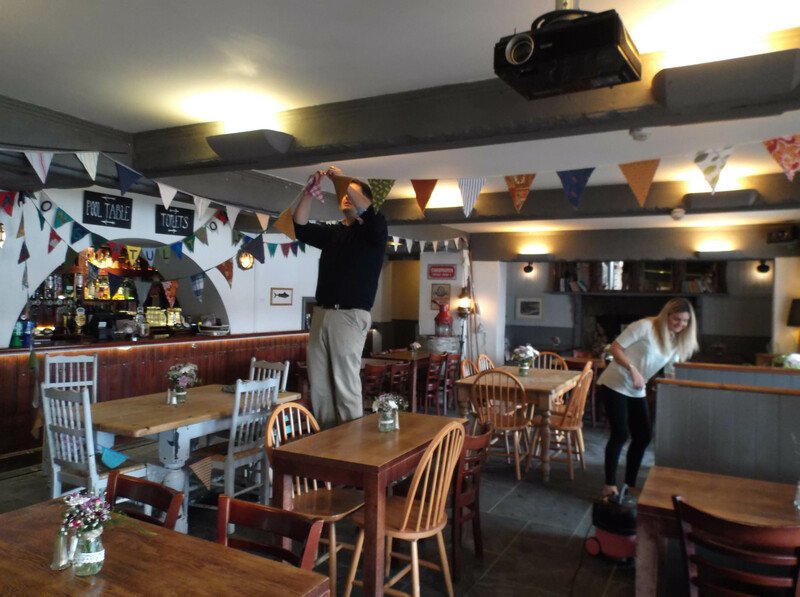 On the morning of the wedding, we visited the pub and found the manager hanging up our bunting. 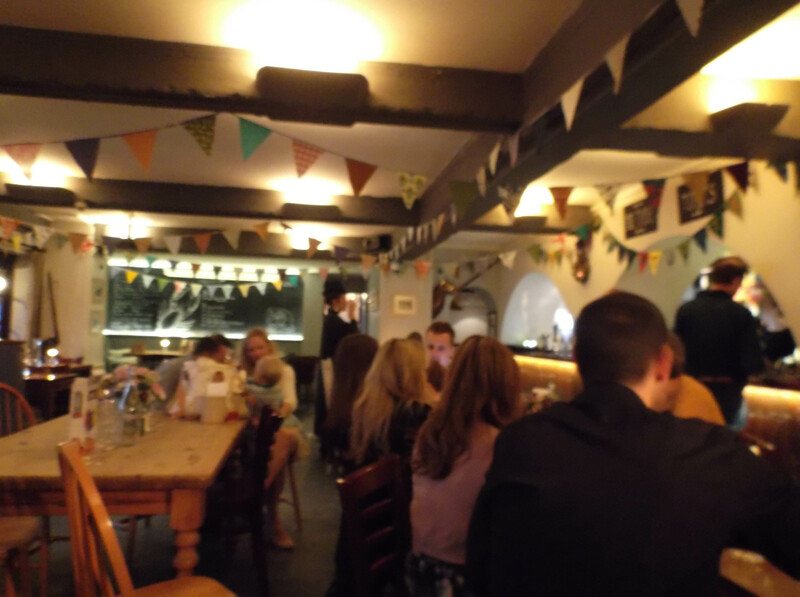 They’d decided to hang the lettered bunting over the bar (amid the toilet and pool table signs…..) This wasn’t the best bunting we made – the glue showed through the light-coloured letters, and it was hard to make out the writing clearly because I’d used such strong colours. The rest of the bunting looked great. There was masses and masses of it – Stephen reckoned we had made over 160 feet – so it was hung everywhere, including outside. Worth all the effort – it really made the place look partyish. I wonder where it will be hung next?! I think bunting is a very British thing, and I enjoy looking at it immensely. Well done! This is very, dare I say, jolly? I hope they use and reuse it for years to come! I inherited a stack of brightly colored painted paper samples from a friend, and kept it for ‘something’, until the year my son was born, when I cut it up into strips and stapled it together into paper chains. It was so simple, and yet so effective, that in the dreary Seattle winters when I hang it in our living room, I am instantly transported back to my childhood, and simple Christmas and birthday parties in the local council hall. The quality of the paper is good enough that even 12 years later I can still bring it out and hang it up, to cheer us up. 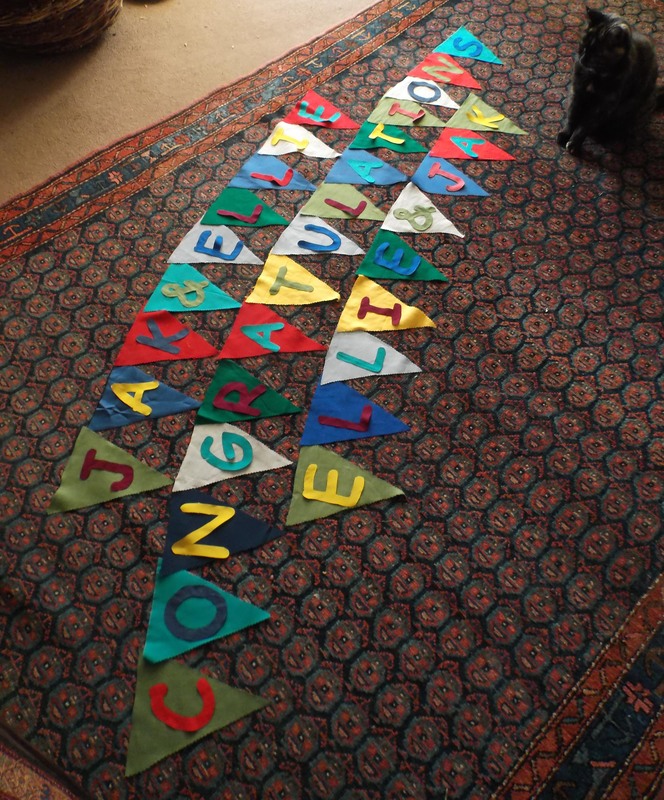 I hope your bunting has a long and happy life, and their marriage too! WOW, when you go on a mission, you GO ON a MISSION!!! I had never heard of buntings until a few months ago and that was from an Australian blog. They look like so much fun flying in the breeze and then in the pub. Just great! Good job. It is true, Susan, – I did take on bunting making very seriously ….. they are so great – I want everybody to make them now! So amazed to hear that you in the States had never heard of them until recently – I thought they’d be the sort of Martha Stewart thing?! Yes, Frithany – jolly is just the perfect word! 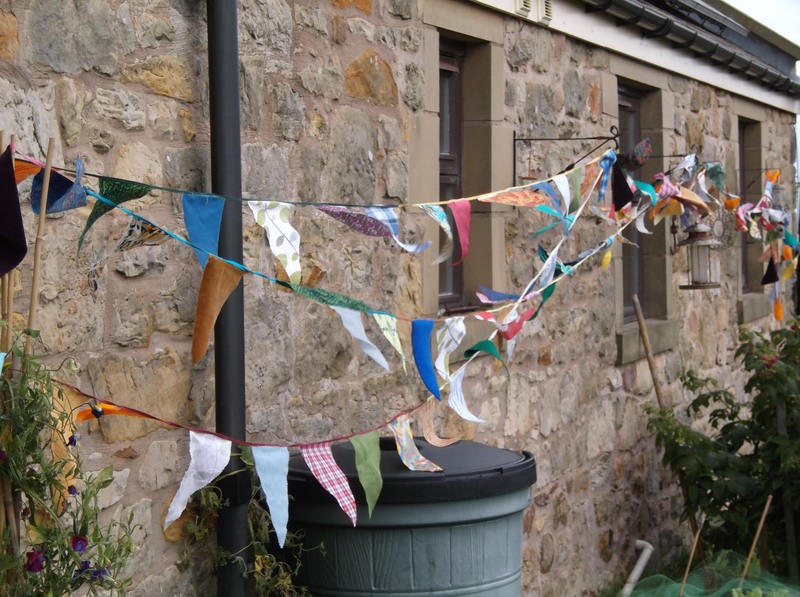 I am sure they will re-use the bunting – and perhaps let friends use it and share it around so it will build up that sort of special treasure feel that you describe with your paper chains. I used to make paper chains too – and they were quite magical, but sadly not as good quality as yours sound so they had to be thrown away. keep on treasuring yours! 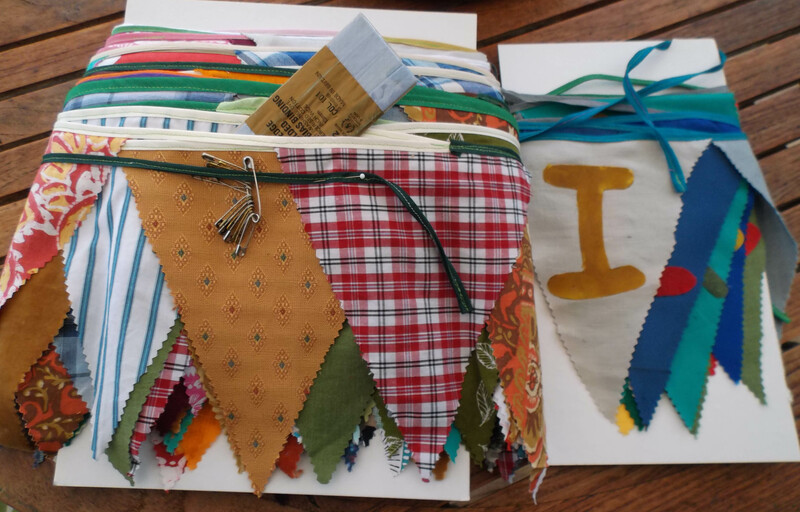 I do love a bit of bunting… I especially love bunting from scraps. It has an exuberance that matchy matchy can’t match! Your bunting is fabulous. They will put it up for birthdays, Christmas and family gatherings… It makes a celebration really. Perfect gift for starting out together. Congrats to you both on wedding and bunting. I did enjoy reading about this process. What a wonderful way to contribute to such a special occasion. I will never look at bunting the same again! And I hope you do make some for yourselves soon – well, maybe not immediately……..
I’ve started seeing bunting everywhere, Polly – do you find that too?! Perhaps one day you’ll come here and find us all “buntinged” up!